It's been awhile, but today I will finally complete my discussion of the article on abortion by Mary Ann Warren. Part One covered two arguments in favour of a right to access abortion. They were the disastrous consequences argument and the right to autonomous choice argument. In this part, the moral status of the foetus is addressed. Warren begins this discussion by looking at the general question of moral status. All ethical theorists, be they utilitarians, Kantians or virtue ethicists, need to have some criterion for distinguishing morally relevant beings from morally irrelevant beings. What is this going to be? Let's see what these are and how they might apply to the abortion question. Albert Schweitzer argued that the chief moral criterion was whatever property it is that distinguishes life from non-life. Living things are functionally organised in such a way as to ensure their own survival and reproduction. As living beings we share in this functional organisation, so we should have a moral concern for all beings with this property. Warren suggests that a concern for life really flows from ecological and aesthetic concerns. In other words, from a desire to preserve a well-balanced ecosphere for practical (food, medicine, clothing) and aesthetic (beauty, wonder, awe) reasons. The problem with using life as a criterion is its over-inclusiveness. While life is valuable, it is not unqualifiedly valuable. There are occasions in which it is necessary to kill another living being. The most obvious of which comes from our need to kill in order to eat (that holds for vegetarians as well since plants are most definitely "alive"). The second proposed criterion is shared genetic humanity. In other words, any beings who share a sufficient amount of the human genetic code qualify for special treatment. Warren dismisses this criterion with some alacrity. She thinks that moral criteria cannot arise simply from evolutionary accidents of birth. I would add that it is not at all clear from evolutionary biology that the idea of a shared genetic humanity makes sense. Although humans do share a large amount of their genetic code, it is also true to say that evolutionary thinking is anti-essentialistic in its thrust. In other words, post-Darwin it doesn't make sense to see humanity as some sort of fixed, immutable essence shared by all human beings. The third proposed criterion is sentience. This is the idea that beings that are capable of experiencing pleasure and pain are worthy of moral respect; beings that are not capable of such experiences do not deserve moral respect. This is certainly a more robust moral criterion, but it suffers from some problems. First, it is not clear which beings have sentience and which do not. Philosophers are fond of informing us that our friends and family could be zombies, who look and behave as normal humans do but have no conscious experiences. Dismissing such philosophical concerns (as we must) we might propose that a minimum condition for sentience is the possession of a nervous system, along with some basic behavioural responsitivity. It is suggested that foetuses only develop these properties in the second trimester. Thus early-term abortions would be acceptable and late-term abortions would not. There are two problems with this criterion. First, it too is over-inclusive as it covers a large swathe of the animal kingdom. Put it this way: a fly has a functioning nervous system, does this mean swatting a fly is morally condemnable in the same way that homicide is? Second, the criterion does not, by itself, establish any exception clauses. It cannot be that all sentient beings must be preserved irrespective of the harm it does to other sentient beings. And yet this is exactly what some women claim arises in the case of the foetus, i.e. that it does them harm. The fourth proposed criterion is personhood. This is a somewhat nebulous concept. It is usually associated with what we might call "higher" mental capacities. In particular, the capacity for developing hopes and aspirations for the future. Warren disagrees with these traditional conceptions of personhood. She argues that what is truly distinctive about persons is their capacity for moral reciprocation. That is: their ability to recognise other people as being the possessors and holders of moral rights. Foetuses almost certainly do not have this capacity for moral reciprocation (they cannot appreciate that their mothers, say, have moral rights). The problem is that neither do young children or mentally handicapped adults. Thus, the personhood criterion seems over-inclusive. The problem in identifying a clear moral criterion leads Warren to consider a different issue: the unique biological relationship between a mother and a foetus. The problem is this: even if the foetus is a morally significant being, its significance is only sustained by another morally significant being. 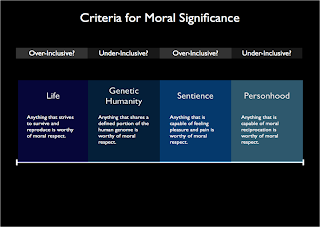 So the moral question is not primarily one of significance, but one of competing significances. Birth becomes a morally relevant demarcation because it is the point at which the child can be offered equal basic rights without violating anybody else's moral rights. Finally, Warren addresses the potential person argument. This is the idea that a foetus has certain minimal moral rights due to its potential to develop into a full human being (with full moral rights). The problem with this is that in no other domain would a potentiality argument work. For instance, Warren argues that every child born in America is a potential voter. But this does not mean they should be accorded a right to vote (note: I think there is a need to unpack that analogy in a bit more detail, but since Warren does not go into it, neither will I). Furthermore, the potentiality argument goes too far. Every possible sperm-egg fusion is a potential life. Does this mean we have to expend resources ensuring that every sperm finds an egg? I think the potential for consciousness argument deserves a bit more consideration than you give it, but I certianly agree with the rest of your post. Well this is just a summary of Mary Ann Warren's article, which is itself a summary of the issues relevant to abortion. This is very interesting, but the chart confuses me. Is genetic humanity meant to be under-inclusive (meaning we should respect animals), but sentience is over-inclusive? These two seem to cancel each other out somewhat. Of course, once you bring animals into it, you have to bring the comatose and everyone else into it etc. I think "potential personhood" is probably the most-used objection I've heard, though the voter-argument is quite relevant. I don't think sentience and genetic humanity cancel each other out. But I agree that the chart is confusing. I compiled it somewhat in haste. The genetic-humanity criterion limits our moral universe to those who happen to share a certain portion of our genome (somewhere between the 99% shared by the chimpanzee and the 100% limit shared only by identical twins). Warren thinks this is arbitrary and has no moral significance. The sentience criterion is not as arbitrary, but Warren thinks the capacity to experience pleasure and pain may extend too far across (not down) the phylogenetic tree for a practicable morality. Do we have moral obligations to flies if they happen to experience pain? Could we ever know this? 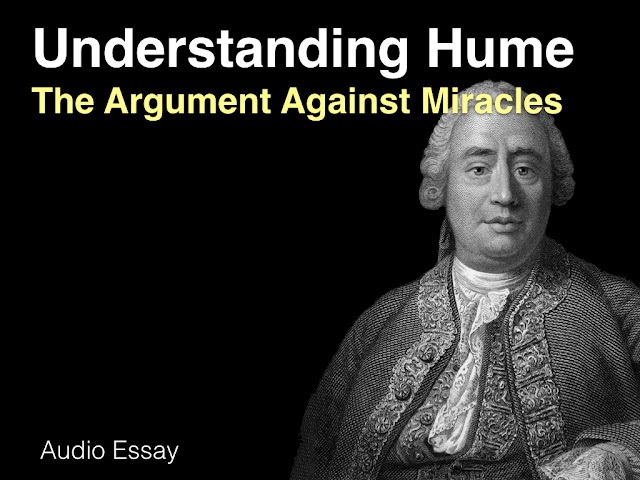 This is why the personhood argument is advanced. It seems to capture something morally significant without extending too far across the phylogenetic tree. But then Warren is worried that this is too exclusive because only mature humans have the capacity for moral reciprocity. Her concerns could be resolved by relaxing the personhood criterion somewhat to include any creature capable of having life interests or stable preferences (this harkens back to debates over utilitarianism - see my entry on Goodin's Utilitarianism for more). I now think that maybe the chart should run life-sentience-personhood-genetic humanity. This would more clearly illustrate that the dividing line for moral significance comes somewhere between sentience and full personhood.